After graduating from Waseda University with a degree in economics, Mr. Ohshima dreamed of visiting America to get his Master’s degree while experiencing the American culture. In 1955, with a few dollars in his pocket, Mr. Ohshima stepped off the airplane in a heavy overcoat on a warm Southern California day. He had planned to go to the University of Southern California to complete his Master’s degree in economics, but with the challenge of speaking and understanding the English language, Mr. Ohshima enrolled in an English class at the Los Angeles City College. It was a two and one half hour bus ride to LACC from his place of residence in Pacific Palisades where he was employed as a houseboy and as a gardener. He also, worked as a translator and guide for a Japanese company, traveled to LA to work at a fish net company, taught Karate, and helped at the produce market early in the morning in downtown LA for a $250 a month income. This was a huge increase from the $25 a month job when he first arrived in California and ventured up north to pick crops in the fields with other immigrants. A gentleman by the name of George Murakami approached Tsutomu Ohshima, inquiring about the mysterious art of Karate. Although, Mr. Ohshima was not interested in teaching anyone Karate, George Murakami persisted because he knew several people who were also interested in lessons. At a prearranged location, Roe Suzuki, his brother Fred, Akimasa Futami, and a few friends, accompanied George to a back room at a bar in Little Tokyo to meet with Mr. Ohshima. After introductions, Mr. Ohshima questioned each person on why they wanted to train in Karate-do. He felt satisfied with their answers and arrangements were made to begin practice for the first time. Original members at Konko Church, 2924 1st. Street in Los Angeles, was the first Shotokan dojo in the USA (photo ca 1957). With the help of Kendo expert, Mori-Sensei, the excited small group held their first practice in the equipment room of the Denker Playground on March 25, 1956 (SKA’s birthday)! Two months later, on May 11th, the early pioneers of Karate moved to the Konko Church at 2924 East 1st Street near downtown Los Angeles. This became the birthplace of the oldest known Karate organization that is still practicing in the United States today. There were no concepts of grading or ranking, just one instructor and the students who were proud to wear a white belt and train seriously. All of the students were either Japanese-American or Japanese foreign exchange students studying here in Los Angeles. As the students enrolled and faded away during the first year, Mr. Ohshima did not know how the future would develop with this small group of Karate members. In 1957, a 37 year old LA police officer entered the room of the Konko Church and became one of the first Caucasians to practice with Mr. Ohshima. His name was Jordan Roth. 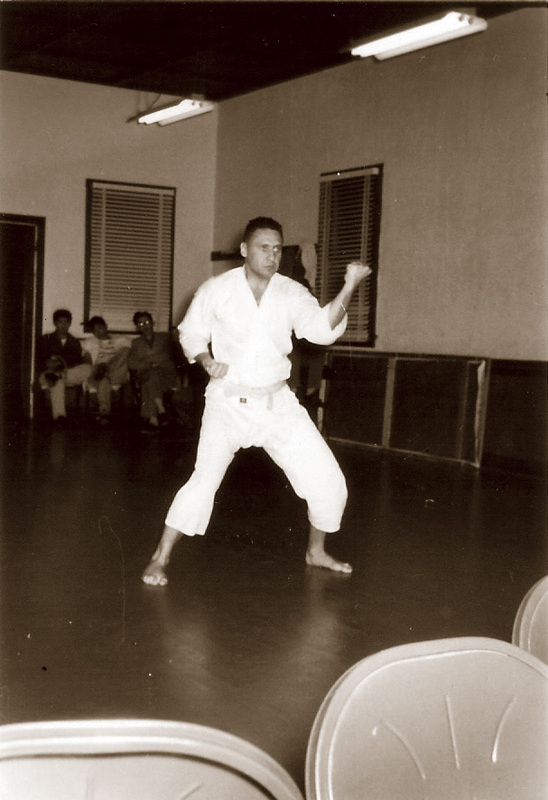 Also, Mr. Ohshima began the Pasadena Dojo at the Japanese Community Center. On March 7, 1957, a young clumsy freshman Joe Stupak from Caltech joined the Dojo. He approached Mr. Ohshima and asked if he would like to instruct a club at the California Institute of Technology in Pasadena. Mr. Ohshima refused, until he checked the reputation of Caltech. James Nerrie, a coach at Caltech, supported the Karate program as part of the physical education department. 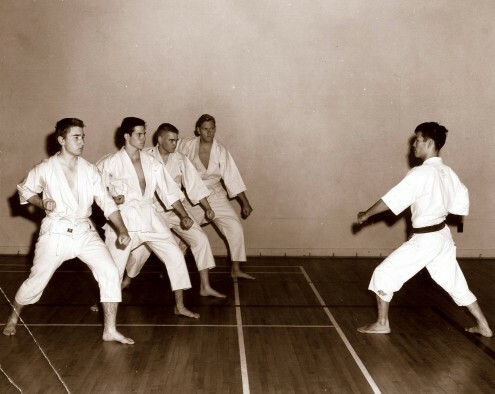 With Joe Stupak as the first Captain of the Caltech Karate Club, he had other alumni, Harold Musselman and Warren Emery training as serious members. 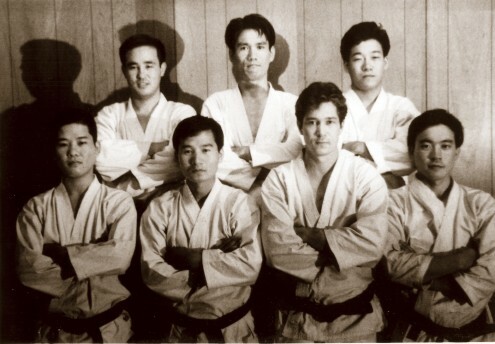 Caltech became the oldest and the most successful university Karate club in America. Master Funakoshi passed away April 26, 1957 in Tokyo. According to the wishes of Master Funakoshi’s oldest son, Giei, the Shotokai (seniors were Genshin Hironishi and Shigeru Egami) was to conduct the funeral. The JKA / Kyokai led by Masatoshi Nakayama protested that they should be the ones to conduct the funeral. No agreement could be reached and JKA / Kyokai boycotted the funeral. This created a rift in Shotokan which continues to the present. Ohshima Sensei leading down block practice in the Caltech gym during early years. 1957, Jordan Roth performing Tekki Shodan at the Konko Church in Los Angeles. 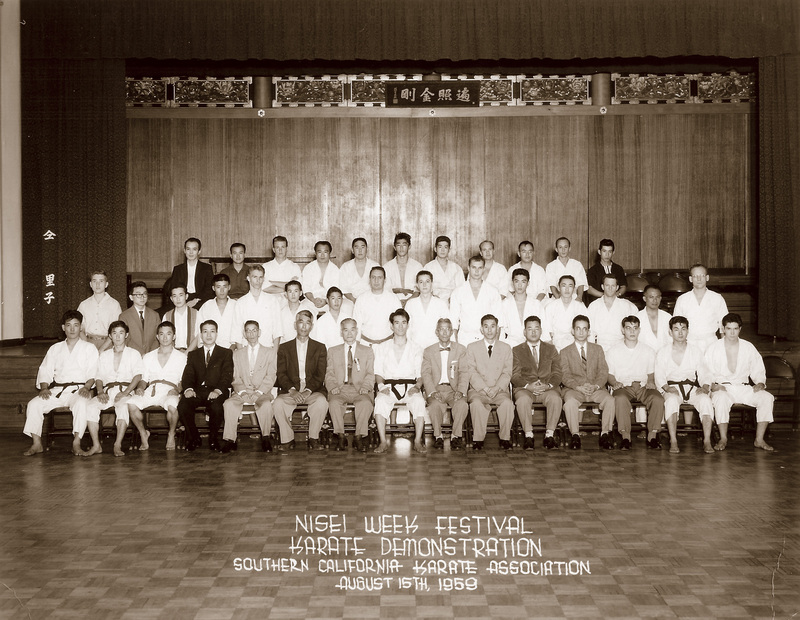 In August, 1957 the Judo Federation held an all day tournament during the traditional Nisei Week celebration. Mr. Kuniyuki, President of the Judo Federation and Mr. Inouye, a Judo instructor invited Ohshima Sensei and his group to present a Karate demonstration, which was totally foreign to the American public. 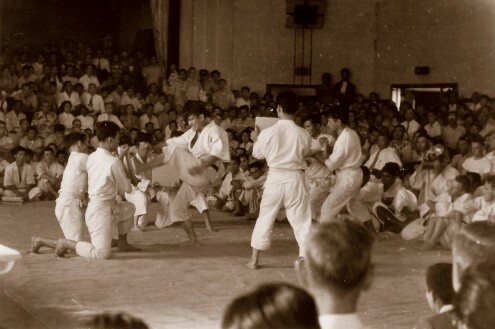 This first public 30 minute Karate demonstration in the United States was held during the lunch break in a noise-filled room at the Koyasan Hall in Little Tokyo. The spectator-filled room became totally silent as the demonstration of Kihon, Kata, Kumite, and board breaking, were performed by the dojo members. Roe Suzuki recalls, “We were nervous in this quiet filled room, but our main concern was Ohshima Sensei. Mr. Ohshima was the only black belt with all white belt members, so he did most of the demonstration. The awe-struck audience gave a tremendous ovation. Mr. Ohshima breaking boards in 4 different ways using 4 different methods during the 1957 demonstration. Mr. Ohshima demonstrating front kick in Little Tokyo in 1957, the first public Karate demonstration in the United States. Two Judo practitioners, Caylor Adkins and his brother Curtis were among the hundreds of spectators who witnessed this historical event in Koyasan Hall. The demonstration wasn’t very long, but the impact on the spectators and the Judo competitors was phenomenal. The group got dressed and left before any questions about this unique and strange martial art could be answered. Caylor Adkins recalled, “After we saw the 1957 Nisei Week Karate demonstration, my brother, Curtis, and I tried to find out where Mr. Ohshima’s dojo was located. No one would tell us (or no one knew). They were really an obscure group.” The Adkins brothers eventually joined Mr. Ohshima. In 1959 Mr. Ohshima felt that the original 17 members warranted ranking and the first Kyu Test was held with the highest rank of 1st Kyu awarded. Caltech became the foundation for the spread of Karate throughout the college and university campuses across America. 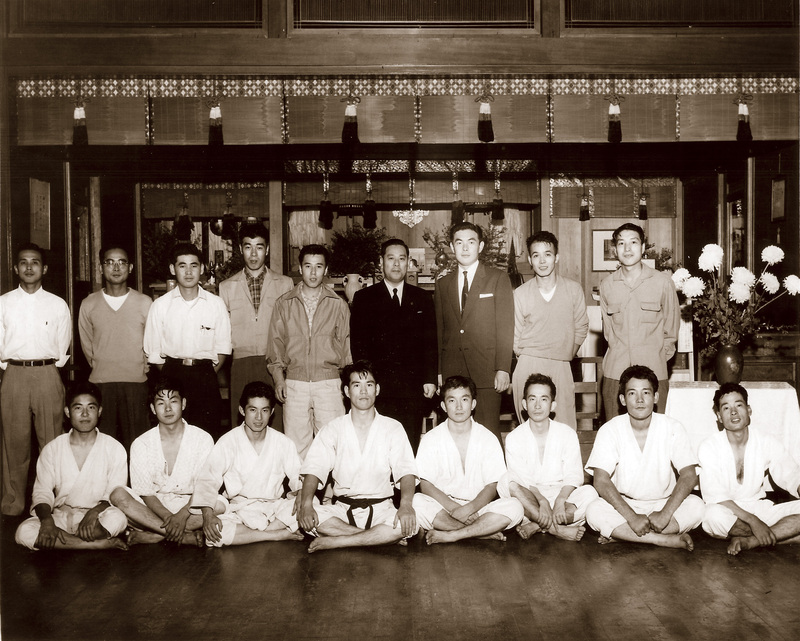 On July 9th, 1959 a small group of 15 students accompanied Mr. Ohshima to the Santa Maria Japanese Community Center to attend the first 4-day Special Training in America. Among them were George Murakami, Roe Suzuki, Mas Norihido, Don Ridgeway, Jerry Emery, Caylor Adkins, Pete Adkins, and Ross Ines. On the first morning at 6:00 am when Mr. Ohshima shouted, “Get up!”, no one came out. Mr. Ohshima didn’t give up. There were no seniors yet who understood what Special Training was about, how to face themselves, or how to motivate the group. The participants were in shock at this kind of practice and only a few pushed hard through every practice. The organization grew rapidly and the Southern California Karate Association (SCKA) was formed. SCKA was the first Shotokan Karate organization in the United States and eventually was renamed Shotokan Karate of America (SKA ca1971). 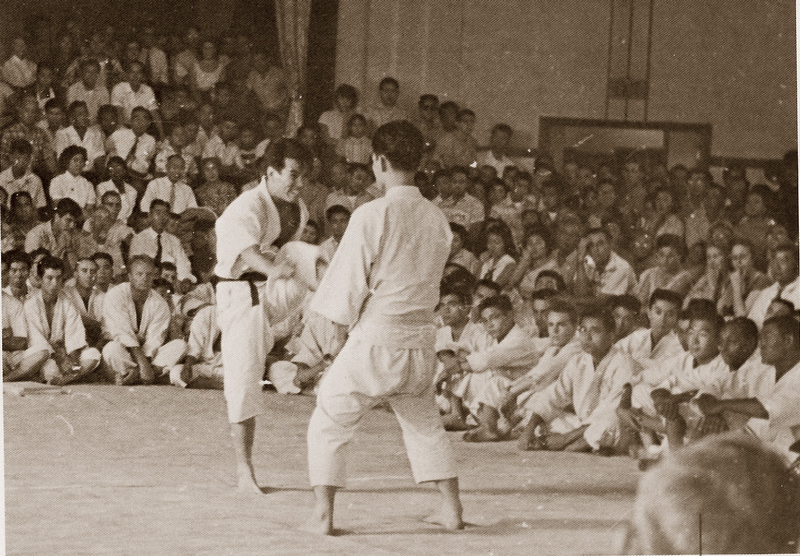 The first dan promotion test for black belt rank was given on December 5, 1959. Six members were awarded the rank of Shodan by Mr. Ohshima, and they shared the honor of being the first American trained black belts in Shotokan Karate. The honored six were Caylor Adkins, George Murakami, Mas Norihiro, Jordan Roth, Roe Suzuki, and George Takahashi. Tsutomu Ohshima, Sadaharu Honda. Missing; Jordan Roth. On December 13, 1959, to everyone’s sadness, Ohshima Sensei departed Los Angeles to tour Europe before returning to Japan. He was not planning to visit the United States again in the near future and had made arrangements to have the senior black belts lead the members at the Konko Church and at Caltech.